Since the days of the first primitive tribes, we have tried to determine why one man is good and another evil. 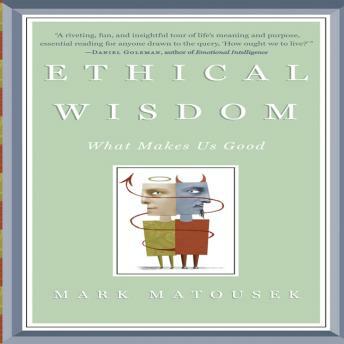 Mark Matousek arrives at the answer in Ethical Wisdom. Contrary to what we've been taught in our reason-obsessed culture, emotions are the bedrock of ethical life; without them, human beings cannot be empathic, moral, or good. But how do we make the judgment call between self-interest and caring for others? What does being good really mean? Which parts of morality are biological, which ethical? When should instinct be trusted and when does it lead us into trouble? How can we know ourselves to be good amidst the hypocrisy, fears, and sabotaging appetites that pervade our two-sided natures? Drawing on the latest scientific research and interviews with social scientists, spiritual leaders, ex-cons, altruists, and philosophers, Matousek examines morality from a scientific, sociological, and anthropological standpoint. Each chapter features a series of questions, readings, interviews, parables, and anecdotes that zoom in on a particular niche of moral inquiry, making this audio book both utilitarian and fun. Ethical Wisdom is an insightful and important book for listeners crisscrossing their own murky moral terrain.